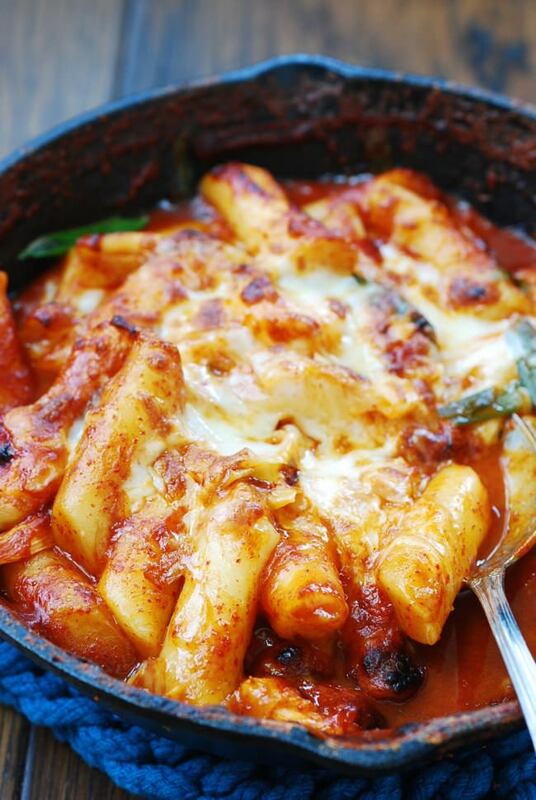 What happens when spicy tteokbokki — Korea’s most popular street food — meets seafood and cheese? It’s elevated to the next level! 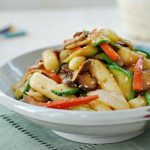 All the contrasting flavors work so well together to create something incredibly flavorful and comforting. 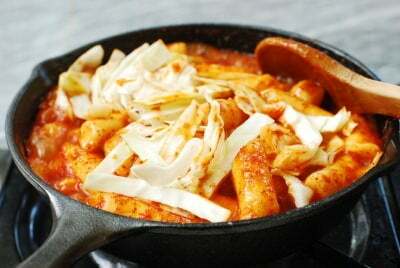 I recently enjoyed seafood cheese ttoekbokki at a Korean restaurant in K-town New York. It was delicious, so I’ve recreated it here for you! 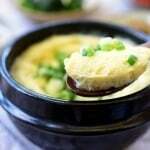 Cheese didn’t exist in Korea in the past. The only cheese I knew growing up was American yellow cheese singles. 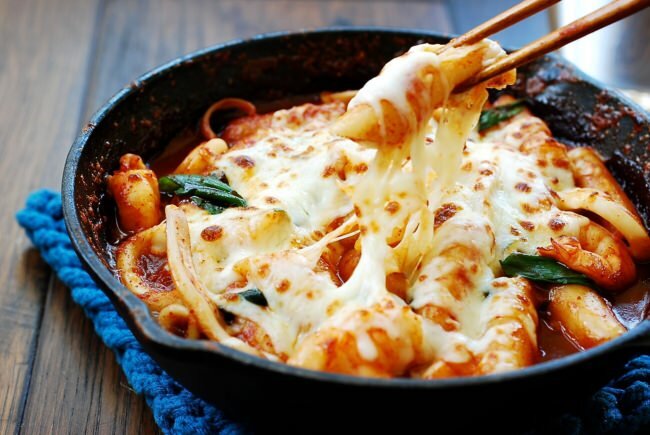 Driven by the young generation, cheese consumption has been rapidly rising in Korea over the last decade as Western dishes such as pizza have become enormously popular. 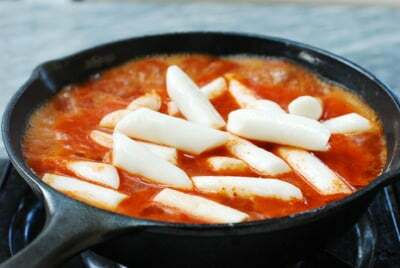 Cheeses are now commonly added to various traditional Korean dishes, such as tteokbokki, gimbap, gyeran mari, pajeon, bokkeum bap, dak galbi, etc. 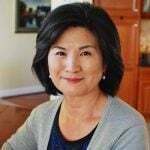 More creative ideas, incorporating cheese into Korean food, are on the rise, and cheese is becoming a “hip” ingredient in Korean cuisine! 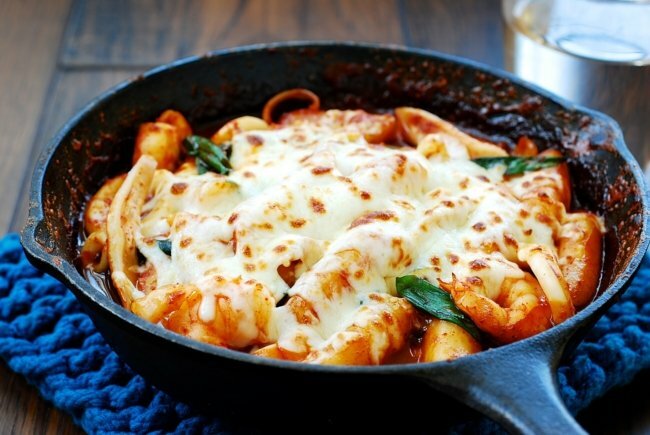 Use any cheese(s) you would use for pizza or pasta. Mozzarella is great, and I also like the pizza blend (provolone, asiago, and mozzarella) in this dish. You can melt the cheese over the stove top, in the microwave, or under the broiler. 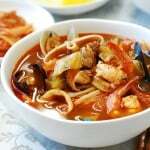 Any combination of seafood can be used. 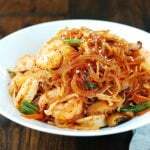 I used shrimp and squid in this recipe. Clams and mussels would be great additions as well. 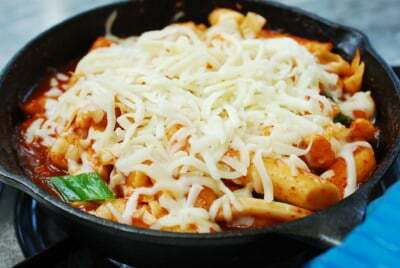 If you don’t like seafood, simply use my traditional tteokbokki recipe and add cheese on top to make cheese tteokbokki. 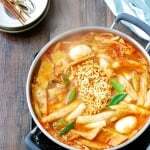 Both of my traditional and soupy tteokbokki recipes use anchovy broth, but I used dashima and shrimp shells to make a flavorful broth here. You can simply use water if you want. The additions of seafood and cheese give the dish lots of flavor anyway. 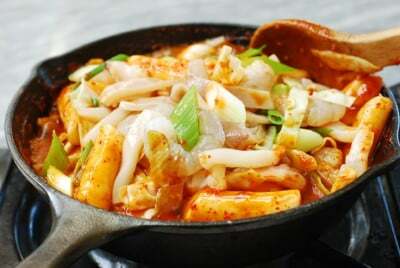 Cheesy, spicy Korean rice cake (tteokbokki) with seafood! 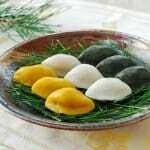 Soak the rice cakes for about 20 minutes if hardened or refrigerated. Clean the shrimp (saving the shells if peeling) and squid, and cut the squid into small pieces. Cut the cabbage and scallions into about 2-inch long pieces. 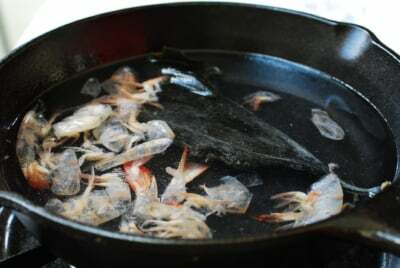 Add 2 cups of water, dashima, and shrimp shells, if available, to a pan. Bring it to a boil, and continue to boil for 5 minutes. Remove the dashima and shrimp shells. Preheat the oven broiler if you want to use it to melt the cheese. Stir in the sauce ingredients. Bring it to a boil over medium high heat, stirring to dissolve the sauce mix. Add the rice cakes. 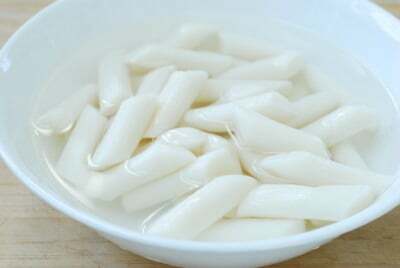 Boil until the rice cakes become very soft and the sauce is thickened, about 8 - 10 minutes. Stir frequently so the rice cakes don't stick to the bottom of the pan. Add the cabbage. Continue to cook, stirring constantly, for an additional 2 - 4 minutes. Taste the sauce, and adjust the seasoning if needed. 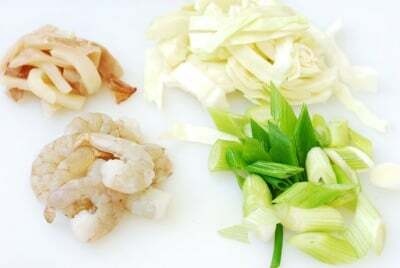 Mix in the seafood and scallion, and continue to cook, stirring, until the seafood is almost cooked. Add the cheese on top. You can melt the cheese over the stove top, covered, or in the microwave, or under the oven broiler. 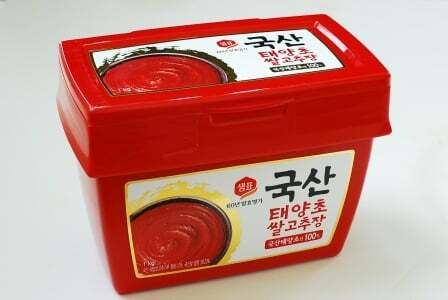 Adjust the amount of chili pepper flakes (gochugaru) if you want to increase or decrease the spicy level without altering the saltiness and sweetness. Hi, Hyosun! 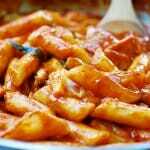 I would like to ask if you can use tteokbokki as a substitute for pasta for some dishes like Lasagna or Baked Ziti? I loved its chewy texture,so I was wonderi if that would work. Any feedback will be much appreciated! Planning to use this recipe as an inspiration for a New Year’s eve main course. Thank you! Yes it can work. 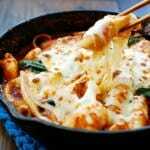 I’ve seen some people making tteokbokki pasta.